This banana muffin recipe is gluten free and a great 'tried & tasted' healthy muffin recipe that 3 of our family members with Celiac (gluten intolerance) love to eat straight from Omas kitchen, every chance they get. Whether you have Celiac or not you will find that this quick and easy banana muffins gluten free recipe is such a great tasting and filling snack that you'll want to make it every week. 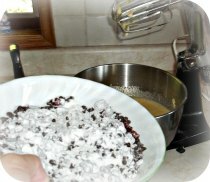 Combine all 'dry' ingredients in a large mixing bowl and set aside. Preheat your oven to 160C(350F). With a hand or stand mixer combine the eggs, oil & sugar. Mix well. Recipe Step #3: bake 'em, Serve'em, Eat'em! Serve warm or let cool, decorate as desired or use as a celebration snack. This is a great healthy muffin recipe alternative & completely gluten free. I have to admit this recipe comes straight from Oma's Kitchen. Growing up, my Mum was a great cook and baker. Walking through a bakery even today whisks me back to the smells and aroma's of my Mom's baking days. With the development of Celiac in several of our family members this is a recipe that is regularly baked as a great snack for the kids and the adults alike. This banana muffin recipe is a great healthy alternative to salty and high sugar processed snacks and at the same time it's a filling and great tasting snack. Try These Alternatives With Gluten Free Rice Floor: Almonds, Raisins, Cranberries or...your choice.